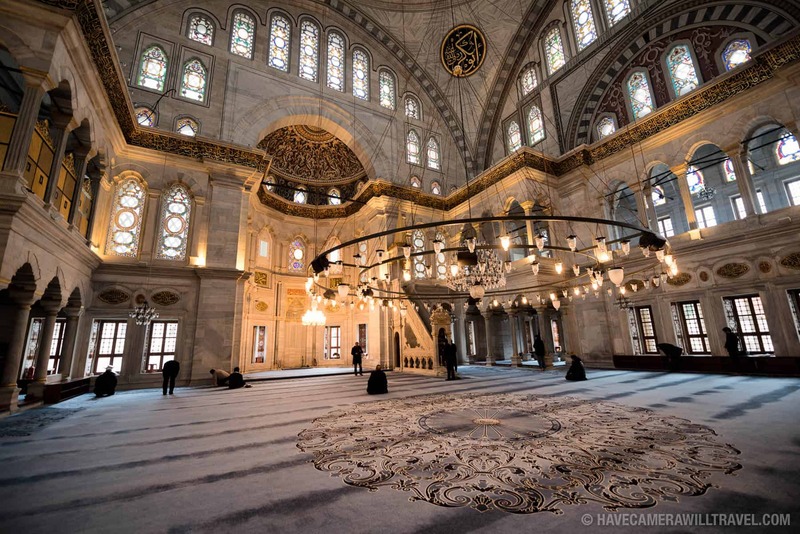 The beautiful interior tiling of the Blue Mosque (Sultan Ahmed Mosque), which shares the peak of the first of Istanbul's famous seven hills, draws the western tourists, but to my mind, Hagia Sophia is even more impressive. 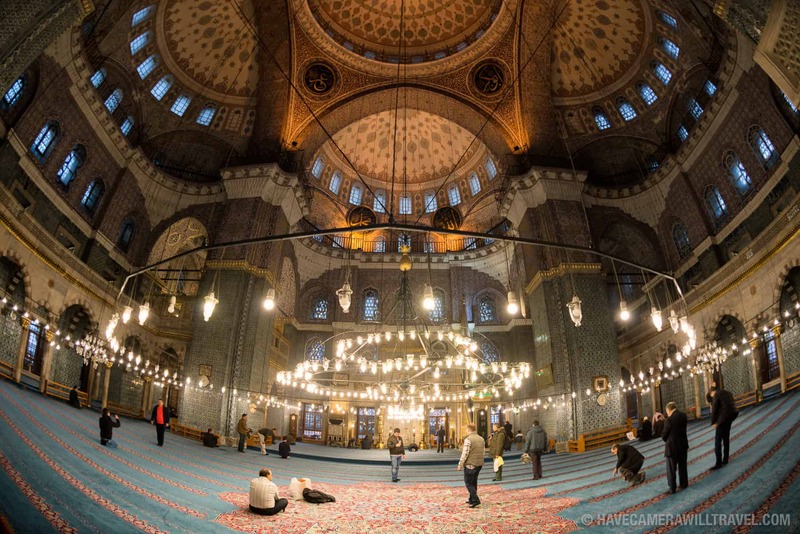 It's a place with a colorful history and special significance as Turkey's first mosque (and the model for many others) and a genuine world landmark. And it is old. Very old. It's about 1,200 years older than the Blue Mosque, 1,100 years older than St. Paul's Cathedral in London, 700 years older than Westminster Abbey, about 600 years older than Notre Dame de Paris, and at least 400 years older than the famous pyramid of El Castillo of Chichen Itza. 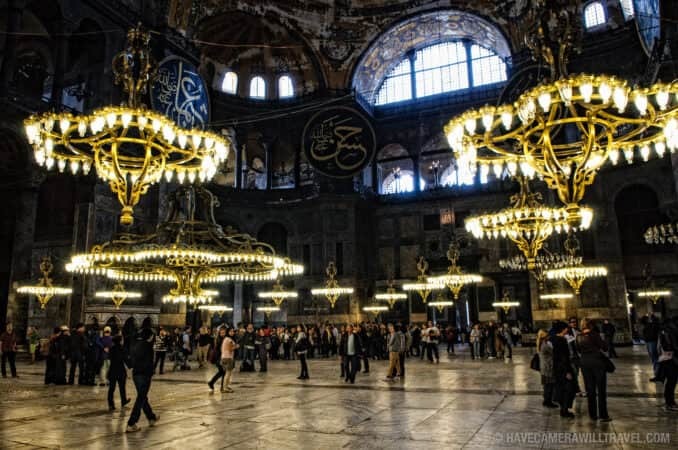 But Hagia Sophia is not some ancient, abandoned ruin–it's a true architectural marvel. 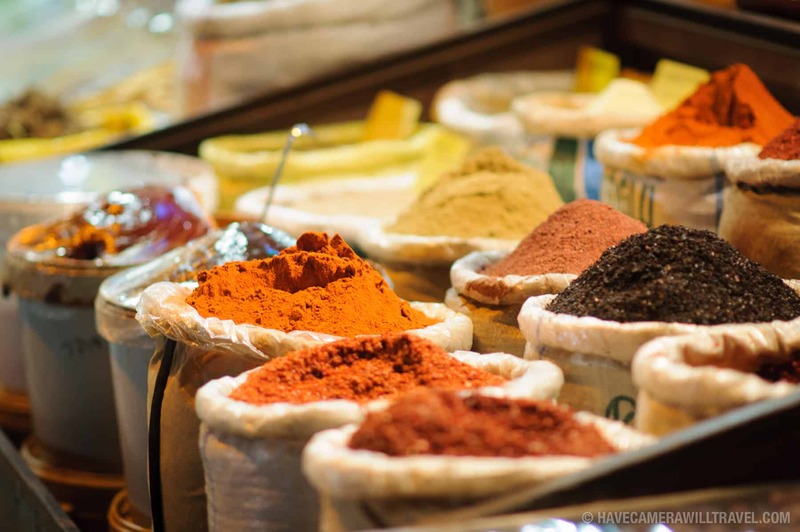 During its 1,500 years, it was a Christian cathedral for almost 1,000 years, a Muslim mosque for almost 500, and a public museum for nearly 80. From the moment you pass through the massive Imperial Door, which was, as its name suggests, once reserved for the exclusive use of Byzantine emperors, you realize that you're somewhere quite special. A massive domed ceiling seems to float a hundred feet above the ground held aloft by barely-there supports. 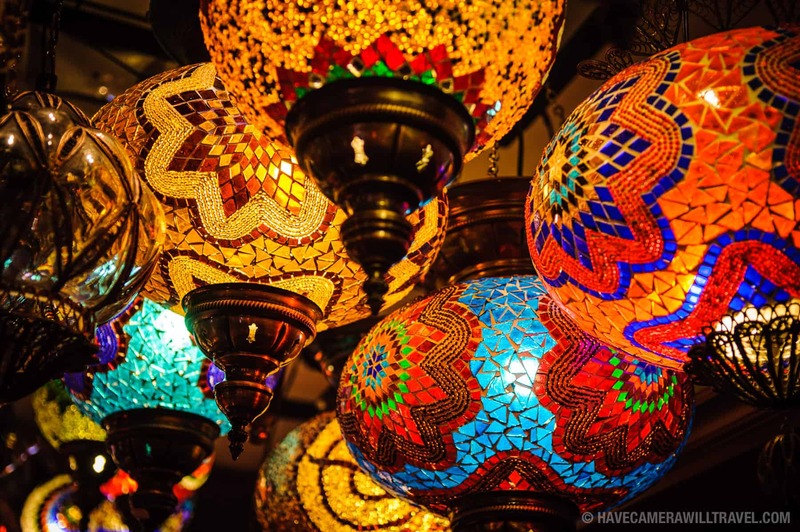 Large metal frames, each with dozens of lights, are suspended from the dome to within about 10 feet of the floor. 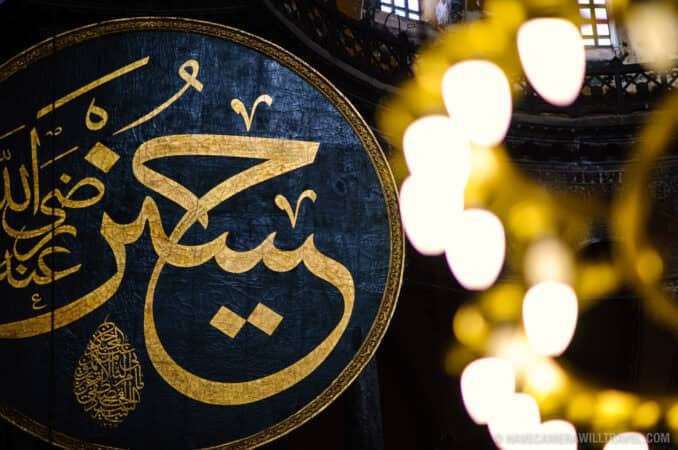 Eight massive, wooden circular shield of black and gold hang from the corners, each inscribed with the name of an early Muslim religious leader. 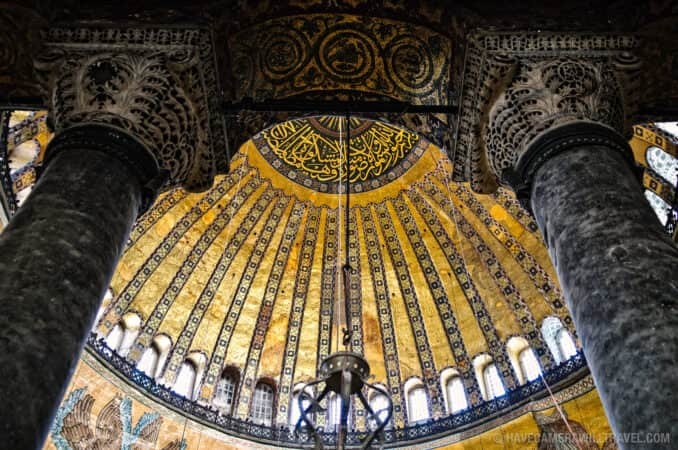 It is known in Greek as Hagia Sophia, in Turkish as Aya Sofia, and sometimes as Haghia Sophia or Sancta Sophia or Aya Sofya. All translate roughly to "divine wisdom." In terms of important contributions to the world's great buildings, Rome's Emperor Constantine the Great didn't too badly at all. Having led the Roman Empire to Christianity, he commissioned two of the world's great churches. Within one busy year, 326 AD, he ordered the construction of St Peter's Basilica in Rome and Hagia Sophia in Constantinople. Neither version of the building that stands now dates quite that far back, but Hagia Sophia comes closest–by about 1,000 years. The site upon which Hagia Sophia now stands was once the site of a pagan temple. In 326, with Constantine himself presiding over the ceremony, the foundation stone was laid and the name given for what eventually became one of Christianity's greatest monuments. The first, more modest version of Hagia Sophia was destroyed by fire in 532. Not wanting for ambition, the new Byzantine emperor, Justinian, decided that rather than simply recreate the original, he would commission something far more expansive. Legend has it that the cathedral's impressive centerpiece, its dome, was inspired by a visit to Emperor Justinian in a dream by an angel. The dome would be its defining marvel, would be a dome higher and wider than any to come before it, and held aloft with a minimum of support so as to create the illusion of floating. The rest of the building would play a supporting role–literally and figuratively–for the dome, rather than the other way around as was the convention. Cathedrals typically take a long time to build. Notre Dame de Paris took about 80 years, St. Peter's Basilica in Rome about 120 years, and St. Paul's in London a comparatively brisk 35 years. Impressively, Hagia Sophia was completed within 6 years. 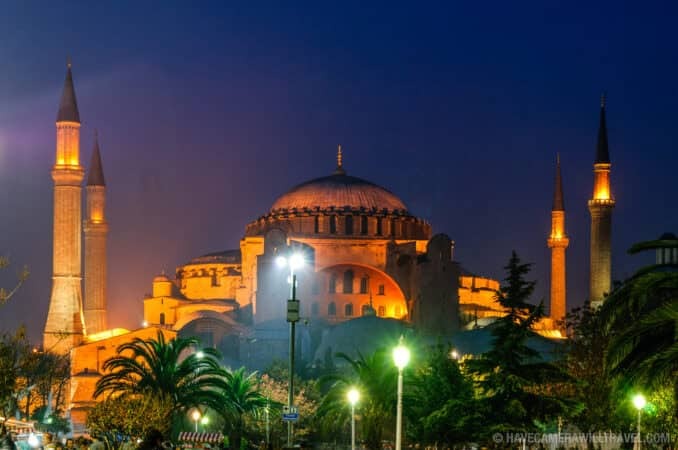 For almost a thousand years, with Constantinople the capital of the Byzantine empire, Hagia Sophia was one of the great centers of Christianity. 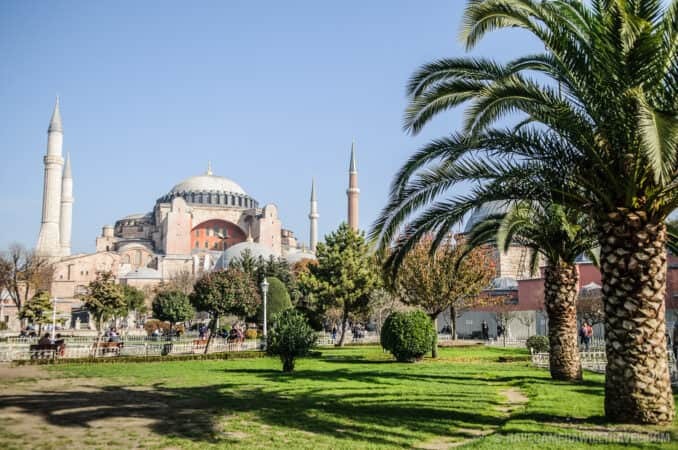 When the city was sacked in 1204 by Latin invaders in the Fourth Crusade, an unknown amount of Hagia Sophia's relics and decorations were looted or destroyed. 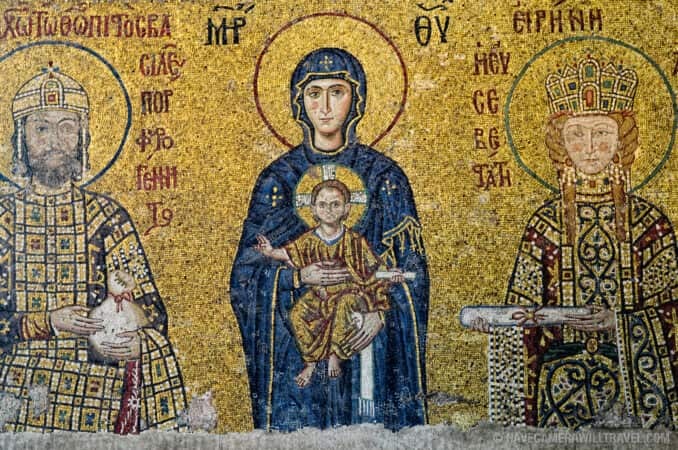 The Latin occupation was short-lived; two years later, Byzantine rule was restored. 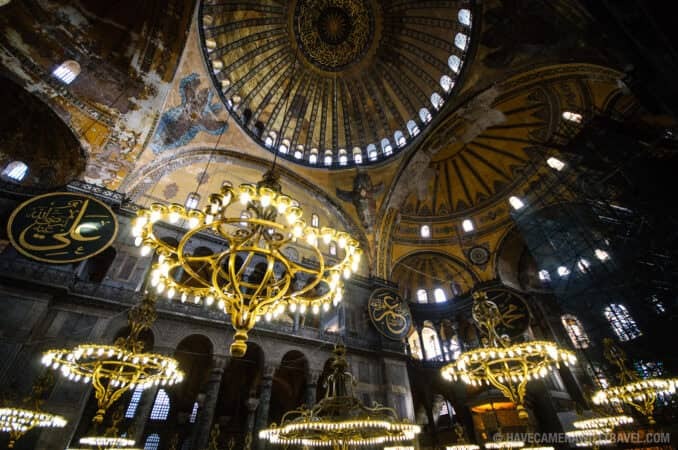 For another two and a half centuries, Hagia Sophia remained the architectural jewel of the Christian Byzantine empire. 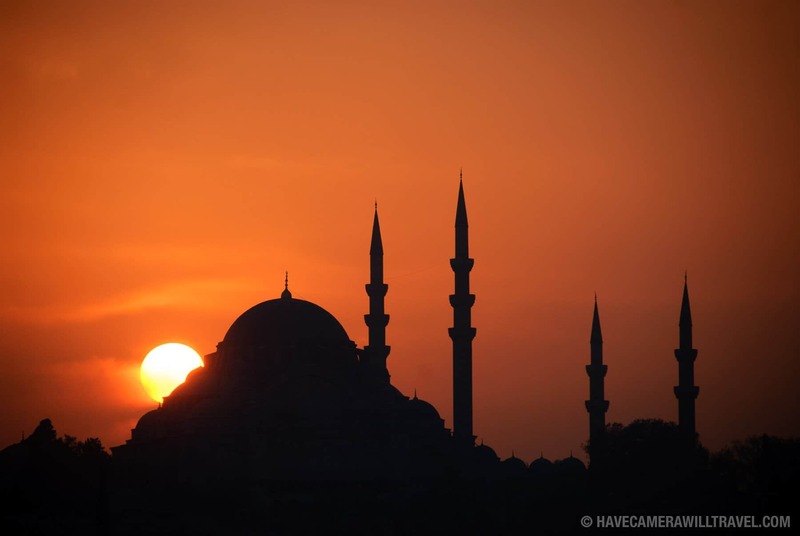 That all changed when the Byzantine capital of Constantinople, which had repelled so many would-be invaders for a thousand years, finally fell permanently. As one small part of his effort to create a secular Turkish state by disentangling religion from the nation's government, Mustafa Kemal Ataturk (usually just known as Ataturk), led the creation of special legislation to convert Hagia Sophia into a public museum.5 The mosque was closed to the public in 1931 and reopened as a museum four years later. Since then it has brought in thousands of tourists a day, generating an impressive revenue stream from the entrance fees. 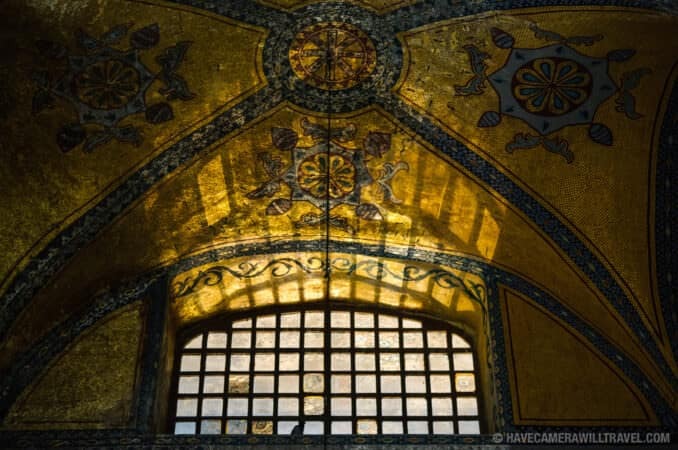 Campaigners for Aya Sofia's restoration have long argued that far too little of the profits from those fees is being funneled back into restoration efforts to clean the soot-caked walls, uncover plastered over mosaics, and buttress the foundations to protect against further damage from earth tremors. Somewhat miraculously, it has mostly withstood the many earthquakes that have destroyed much of the rest of the city at various times. And while it hasn't emerged entirely unscathed, the damage has, for the most part, been superficial. 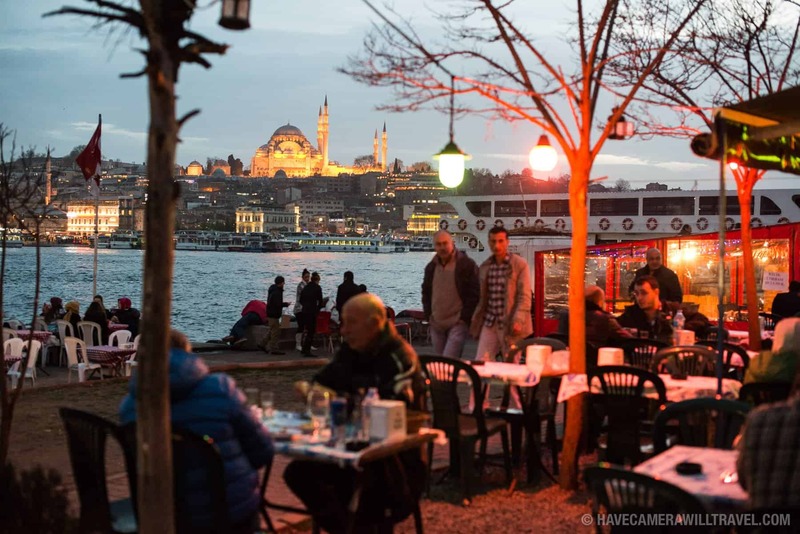 The view from across Sultanahmet Park, which lies between Hagia Sophia and the Blue Mosque. Photo by David Coleman. How to license & download this image. One of the many impressive chandeliers. Photo by David Coleman. How to license & download this image. 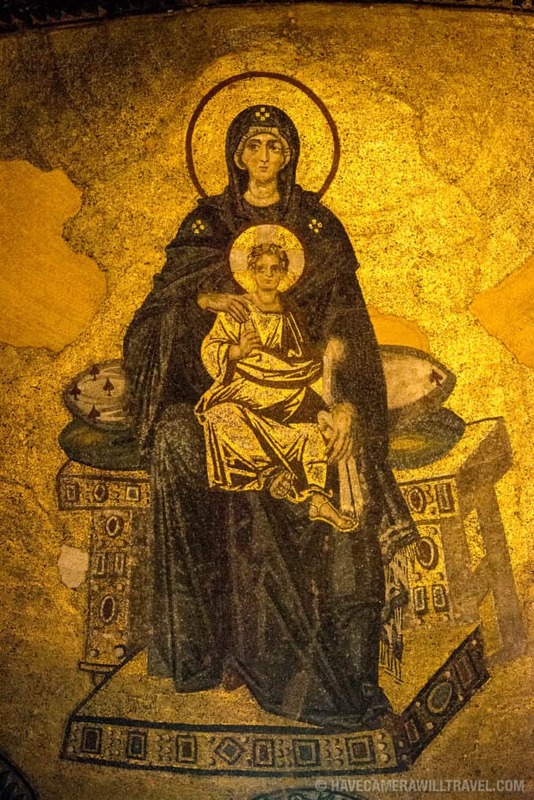 Apse Mosaic of the Theotokos (Virgin Mother and Child). Photo by David Coleman. How to license & download this image. The scaffolding is moving around as the renovation project progresses. Photo by David Coleman. How to license & download this image. Deësis Mosaic. Photo by David Coleman. How to license & download this image. A closer view of the Deësis Mosaic. Photo by David Coleman. How to license & download this image. A cobblestone ramp that radiates from the main entrance. Photo by David Coleman. How to license & download this image. A decorated room near what is now the exit. Photo by David Coleman. How to license & download this image. A guilded mosaic. Photo by David Coleman. How to license & download this image. 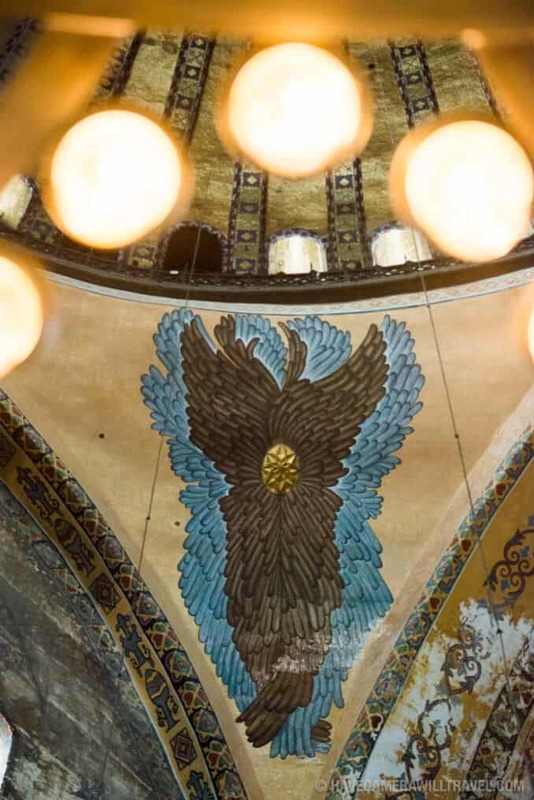 Hagia Sophia is open Monday to Saturday, 9 to 7 to summer and 9 to 5 in winter. Entry tickets are 30TL for adults. More info. 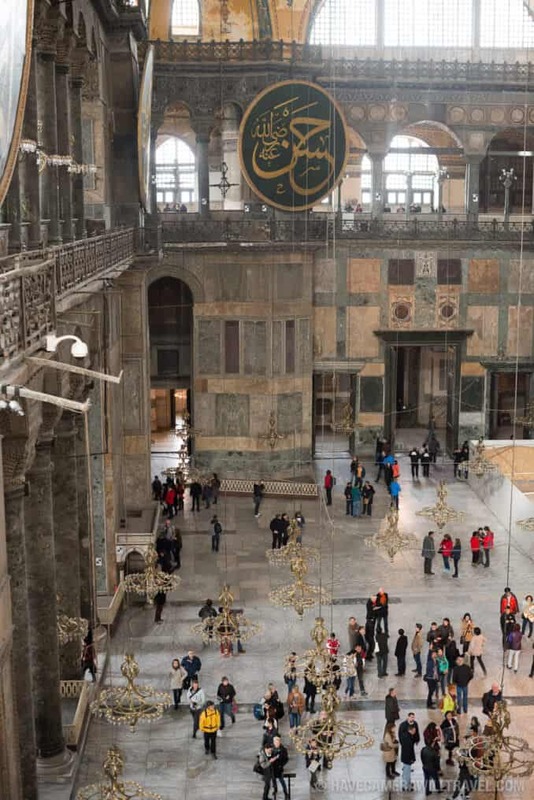 Hagia Sophia is one of the participants in the Museum Pass. As one of Istanbul's most popular tourist attractions, it gets busy, and there can be long lines for the ticket window. Next to the ticket counter are a couple of automated kiosks where you can buy tickets with a credit card. The Museum Pass is also a good way to skip the queue. Going at opening time doesn't guarantee a quick line, but it's often a safer bet than going later in the day. 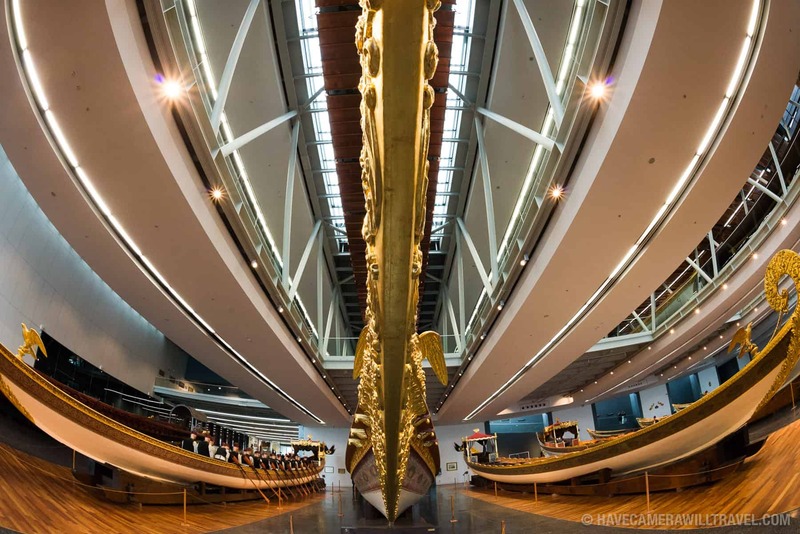 The interior is in the midst of a multi-year preservation and restoration process. Expect some rather extensive scaffolding in the main hall. It's a museum, but there's not much in the way of text explanation of what you're looking at. A guidebook is handy. You'll also find plenty of guides offering their services just outside the front entrance. Some are good, some aren't, so it's very much hit and miss. 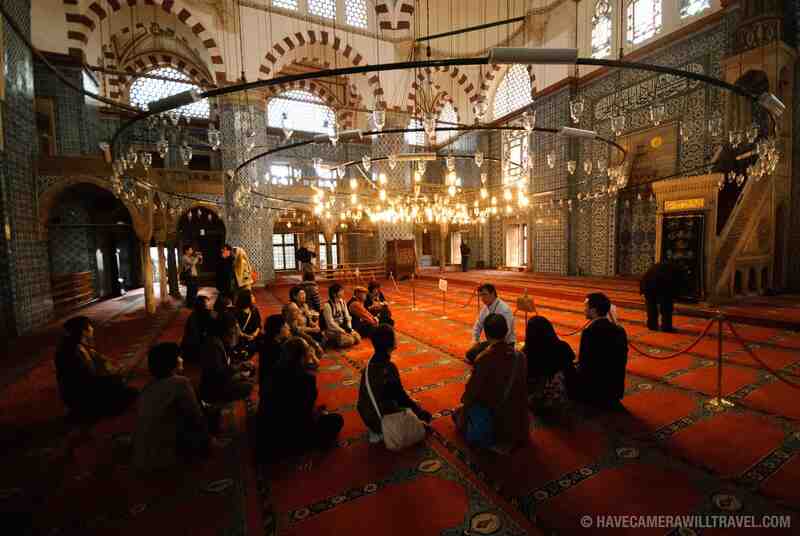 Since it's no longer a functioning mosque, there's no need to remove your shoes when you enter. Which is a good thing--the floor is stone, and inside isn't heated in winter. 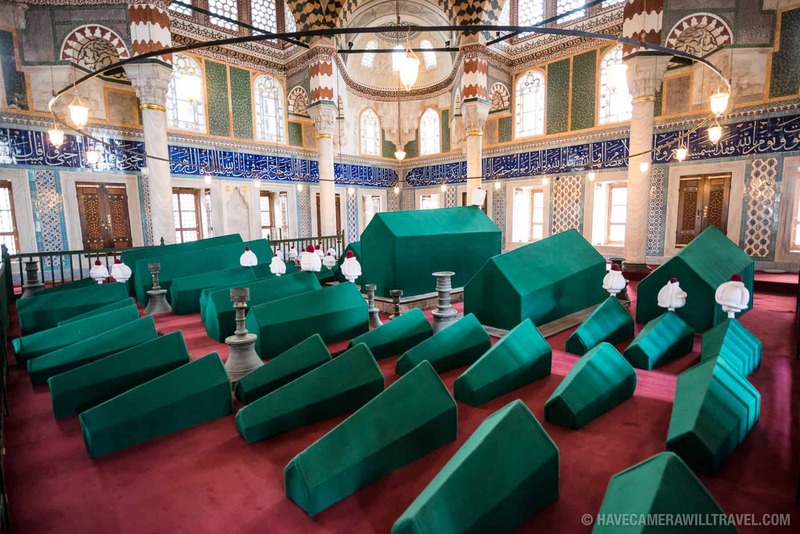 The Tombs of the Sultans is part of Hagia Sophia but has a separate entrance around the side of the complex. You can find more information here.